The city of Bristol in the UK has many claims to fame including being the home of the well regarded Bristol Motor Car. 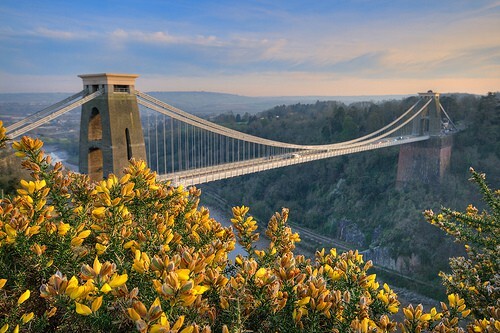 None however match Bristol’s legendary landmark, the Clifton Bridge over the Avon Gorge which links Clifton to Bristol. Long held as an engineering marvel, the Concorde on its final flight in 2003 over flew the bridge as a tribute to its high standing on Britain’s list of engineering feats. This 500 meter span (1640.4 ft) was designed for the horse and carriages of the 19th century yet today handles 12,000 automobiles easily every day. From 76 meters (250 ft) above the Avon River the bridge offers magnificent views of the spectacular gorge between towering cliffs and the river below. In 1753 a Bristol merchant left 1000 pounds in his will as seed money to build a stone bridge. It was 80 years before funds had accumulated to begin the building of a bridge. A stone bridge was ruled too expensive and a design competition was held for a suspension bridge. There was no decision on a design at that time. Another competition was held in 1831 and the winning designer was a 24 year old, Isambard Kingdom Brunei, who went on to become one of the UK’s most influential engineers. The original design featured Egyptian styled towers at each end of the bridge. Insufficient funding resulted in simple unfinished stone towers being built instead. A recession caused delays and a lack of funding causing the work to stop completely in 1843. Brunei went on to other jobs. In 1851 the existing ironwork was taken down and used on another Brunei bridge project elsewhere in the UK. At the time of Brunei’s death in 1859 there was no prospect of the bridge ever being built. However his engineering peers thought the bridge should be built as a memorial to his engineering genius and fund raising was undertaken. In 1860 one of Brunei’s other bridges was demolished to make way for a new railway bridge. The chains from that bridge’s demolition were purchased for use in the construction of the Clifton Bridge. Brunei’s design was modified so that the bridge that was finally built is wider and the deck is much stronger than Brunei had envisioned. The building began again in 1864 and was completed in two years. In 1952 Parliament established a trust to manage the bridge. There is a toll of 50 p for vehicles but the 5 p toll for pedestrians in not enforced. The short walk of only a few minutes across the bridge offers dramatic views in both directions. After crowds jammed the bridge in the summer of 2003 during two popular Bristol events, concerns arose about the weight of all those visitors who were traveling to and from Bristol over the bridge. Since then the bridge is closed for 2 days in mid July each year for the charity fund raising Ashton Court Festival of Bristol and for the International Balloon Fiesta held in August as a precautionary measure due to the sheer numbers who would use the bridge at those times. A visit to Bristol, once an important seaport, just 110 miles west by southwest of London, offers a rich and varied smorgasbord of activities for any visitor to the UK. Amidst all of these attractions, the Clifton Bridge takes precedence. It has become the very symbol of Bristol.